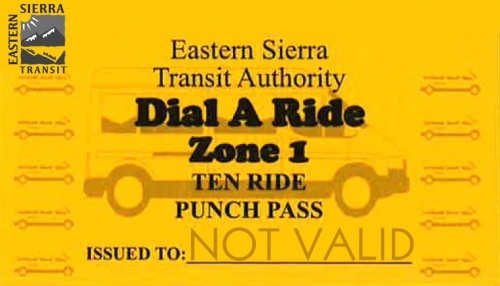 10-Ride Punch Bus Passes are available for Bishop, Lone Pine and Mammoth Lakes. Local pickup is available Monday-Friday from 8am to 5pm at the ESTA Bishop Office (703 Airport Road). Please specify in which area you would like your 10-punch pass to be valid. 10 Ride ESTA Bus Punch Pass is valid for Bishop, Lone Pine, and Mammoth Dial-A-Ride.